Successfully Added Machismo - Cigarette Lighter Cellphone (Touchscreen, Dual SIM) to your Shopping Cart. Say hello to the world's hottest cigarette lighter mobile phone - The Machismo! 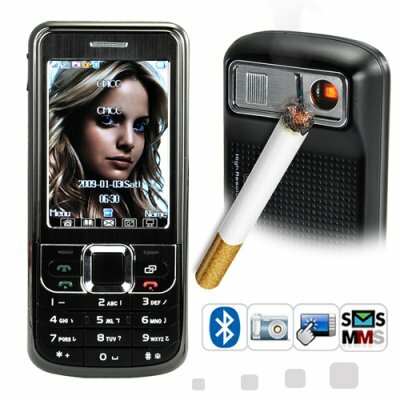 Not only does it light your cigarette, but it's also a super Triband, Dual-SIM cellphone with 2.5 inch touchscreen! The problem with modern life is you have to carry around too many things in your pockets. Wallet, keys, iPod, cellphone, and if you're a smoker - a cigarette lighter too. Well here's the perfect solution - The Machismo. Instead of carrying a phone AND a lighter, just turn this amazing phone around, slide open the safety latch, and the underlying heating element heats up in under 2 seconds. Place your cigarette on the glowing element and puff. Your cigarette is lit and you can enjoy your smoke. Super huh? Yes, Machismo! But there's so much more! The Machismo is a superb triband phone which supports the following global GSM frequencies: 900, 1800, and 1900 MHz. It also comes with Dual-SIM slots so you can have two cellphone numbers with one phone. This is great for business and personal contacts. Or you can give one telephone number for each of your two girlfriends! Throw in a 2.5 inch touchscreen display and you have the perfect solution for your on-the-go guy life! The Machismo comes packed with tons of ultra-useful features like a 1.3 MP digital camera, video camcorder, a mp3 music player, an mp4 video player, PDA tools and so much more. The Machismo has Bluetooth so you can pair your phone with other devices and here's some more great news - we've thrown in a free 2GB TF microSD card to store and save your media onto! Don't delay, click "Add to Cart" right away and in a few days you could be the proud owner of this state of the art unlocked dual SIM triband touch screen mobile wonder with cigarette lighter! Brought to you by the leader in factory direct China electronics - Chinavasion. Due to its efficient heating element design, use of lighter does not significantly drain cellphone battery. Perfect for chain smokers! Background noise option which allows you to simulate being in different environments while on a call. How long should I charge the battery before first use? Before you use the battery for the first time, please charge it for 12 hours. Should I load MP3's or WAV music files into my phone to listen to? It's a trade off really. With MP3's, you get lower audio quality, but because of its small file size you can fit more into memory. With WAV files, you get CD quality music, but on average, one WAV file is equivalent in size to ten MP3 files. Great to hear that the phone comes with 2 batteries. What if I need more batteries, what should I do? Simply contact our customer support department to order replacement accessories. Easy peasy. How many contacts, can the phone hold? The phone itself has the capacity to hold 500 contacts. SIM cards usually hold 250 contacts. Since this phone can hold two SIM cards, altogether you are looking at 1,000 contacts. That's a lot of friends! Can I change the ringtone with this phone? Definitely. The phone provides for many preset ringtones. You can also load your own MP3s to act as ringtones or use the phone's sound recorder to record your own voice or sounds as a ringtone. I heard somewhere that I can record phone conversations with this phone. How do I do that? When a calls come in, you will be presented with an option box. Press that key and a menu will appear. One of the items on the menu will allow you bring up the sound recorder to tape the entire conversation as a sound file for playblack at anytime. How do I change my ring tone? Tone volume and set up is found by pressing PROFILE icon and not the SETTINGS icon. Once in profile, select GENERAL and then CUSTOMIZE. You will be given the opportunity to change ringing options. What is Dual Standby and does the Machismo phone have it? A phone which is designed to work with 2 Subscriber Identity Modules (SIMs) are called Dual SIM phones. Of these Dual SIM phones, the ones which allow both SIMs to be active at the same time so you can receive calls on both are called Dual Standby phones. Yes, the CVOG-M93 is a dual SIM, dual standby phone. I love this phone, arrived on time! Very nice looking,easy to operate. The lighter works perfect.Everybody wants one lol. this mobile is very good and the lighter works all the time. on 2010-03-27 00:15:30 I like it, but the instruction manual isn't to accurate. Its a real nice phone and works great, but the instruction booklet it came with isn't too accurate and some of its details are incorrect. I've found out how to use it on my own.